Arguably, this album is one of the best hard rock/metallic albums of the last couple years. The songs are all very strong, without exception. The band`s sound leans toward but transcends that of Alice In Chains by coming across a bit angrier. The production and arrangements feature lots of little nuances (sound bites between tracks, unusual instrumentation deep in the mix) that really elevate this work nearly into the arena of fine art. The use of vulgar language on some of the tracks might not appeal to everyone, but for fans of harder edged music, this one is very close to a "must have" release. 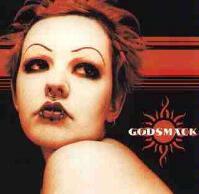 Godsmack (Sully Erna: vocals, Tony Renbola: guitar, Robbie Merrill: bass, and Tommy Stewart: drums) are a Boston based band who originally recorded this album as a self-released CD on $2,500. After being picked up by Republic/Universal Records, the disc quickly went gold. Moon Baby is a nice hard rocking number with an interesting rhythmic structure and potent instrumental break. Definitely not for those who try to avoid profanity, this is a wonderfully intriguing cut that is full of angst. It has a considerably hard rocking, but polished, approach. Another angry one, the texture here has an almost buzz-saw feel at times, and a tasteful, yet crunchy melody. This is one of the best cuts on the album, and really has a very addictive groove. "Do like I told you, Stay away from me, Never misunderstand me, Keep away from me". More from the vulgar files, Time Bomb features a nice crunchy texture and staggered rhythm, and is a bit Nine Inch Nailsish at times. This one has some wonderful keyboard based segments that serve to create an intriguing contrast. This solid rocking composition has great musical textures. An almost funky guitar line drives much of this piece as the number moves forward in powerfully growling modes. This is another with a very fascinating groove. An almost Alice In Chains oriented tone pervades this number, a brief and intriguing instrumental that is more or less a prelude to the next song. This is a groove oriented hard rocker. Starting off with sound effects, then moving to drums, the heavy guitar comes in in waves with a nice wah sound, before a solid rhythmic groove takes over the piece. Now or Never is a more sedate song that still rocks. It has a considerably catchy hook and exciting rhythmic patterns. Coming off a bit punkish in the intro, this song has a definite punk/metal feel, seeming almost a bit like the punkier Metallica cuts. Not completely straightforward, it features a nicely odd spoken-word segment and another weird segment that feels almost like a modern Doors piece. Another nice metal groove, this one feels for a moment or two a bit like old Judas Priest, but has a much more modern sound, again a bit Alice In Chains oriented. Voodoo is a considerably catchy song with an almost tribal rhythm to it. It does have that Alice In Chains sort of feel also, and is quite a strong, less rough-edged number. This track is nearly a percussion solo with some vocals.